As you can probably guess my friend is not a fiddle player. A good bow usually starts at about $1,000. And buying a cheap one, well, let’s just say you get what you pay for. Comparing the two is like comparing a BMW to a Ford (sorry to all you Ford drivers). Both cars will get you from point A to point B but one will be more comfortable, more luxurious, more detailed and will just be a better ride. As with cars, each bow is so different and finding the right one depends on your needs, what you want out of it and what your budget is. But just remember your bow is just as important as the instrument. You can’t play the fiddle without the bow. So to just “buy a new one” isn’t as easy as it sounds. 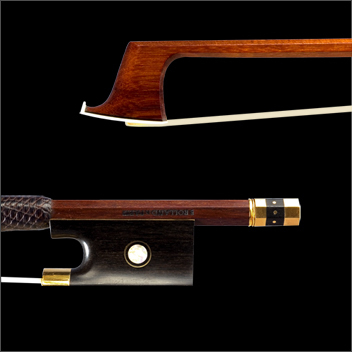 Quality Wood – A quality bow will be made from Pernambuco as it is strong, dense and resonant. Unfortunately, Pernambuco is an endangered wood so it is hard to get and can get pricey. Bow makers are constantly trying to find other woods to work with but none of which seem to have the rich qualities of Pernambuco. You might see less expensive bows made from “Brazilwood” which means it could be any kind of wood. These unfortunately, don’t perform as well. Detailed and Fitted Frog – Most high quality bows have frogs made of ebony with sterling silver or gold fittings. In my opinion, a good bow maker puts time and craftsmanship into the frog so that not only is it functional but it sits firmly on the bow without any play and looks like someone put some love into making it. Less expensive bows have frogs with nickel silver which really isn’t silver at all. Camber and Weight – The stick should have a curve (camber) in it that is evenly weighted and when you tighten the bow it should be smooth with no flat spots. The weight of a violin bow should be between 58-64 grams. This is personal preference, some like a lighter bow and some like it slightly heavier. Though I have no idea what my bow weighs or if it has the precise camber, I do know that I love the way it feels in my hands and the tone it brings out in my instrument. The detailed markings on my frog are beautiful and the bow offers this light airy sound that I haven’t been able to find in another stick. It just works effortlessly with my fiddle. It is truly my BMW of a bow. So buying a new one at this point is just not an option because my bow was meant for me.